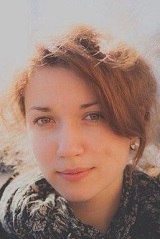 Vera Slasnaya is a choral conducting student of the Rimsky-Korsakov St.Petersburg State Conservatory since 2010. In 2008 founded the Art Sonus choir. In 6 years of its work the choir became the participant and winner of different municipal and international competitions, including: Istanbul International Chorus Competition (2012, 1st prize in mixed choir category), International Music Festival and International Choir Competition Šiauliai Cantat (2013, Lithuania, 1st prize in mixed choir category, 2nd prize in contemporary music category), International Chorus Competition Zlata Vilna (2014, Bosnia, a prize for the best performance of contemporary music). In April of 2014, she became the winner of the 3rd prize at the V.Rovdo Open Competition of Choral Conductors in Minsk, Belarus. In 2011-2012, she conducted a few master-classes of Russian sacred music in Denmark (Royal Academy of Music Aarchus). Since 2010 has been working in St. Petersburg School for Adults named after N. Rimsky-Korsakov.